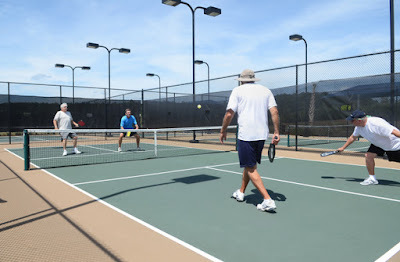 Despite the quirky name, pickleball is a fast-growing competitive sport that has nothing to do with a brine-soaked cucumber. The unique sport is a hybrid game of ping-pong, tennis and badminton, which has grown in popularity across Beaufort County in the past decade. The name originated when one of the game's founders, former U.S. Rep. Joel Pritchard of Washington state, noticed his dog Pickles chasing a ball. However, Pritchard's wife, Joan, said she called the game pickleball because the combination of different sports reminded her of pickle-boat crews in which oarsmen are chosen from the leftovers of other boats. Whatever its name's origin, there's no debate over its growth.